You have no idea how to decode it, but you know that your grade depends on it, so you are willing to do anything to extract the message. Fortunately, one of your many agents on the field has stolen the source code for the decoder. This agent (007) has put the code and the message in the file secret.cpp, which you can download from the laboratory of your technical staff (Q). Your assignment is to decode the message, and find the keys. •Memory contains nothing but bits. 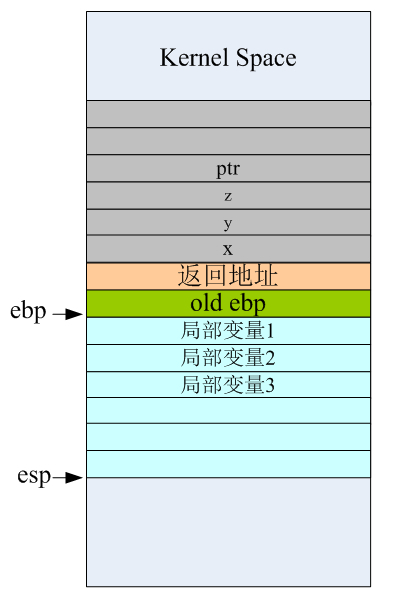 Bits are interpreted as integers, characters, or instructions by the compiler, but they have no intrinsic type in memory. •The compiler can be strong-armed into interpreting integers as characters, or even as instructions, and vice versa. •Every group of 8 bits (a byte) has an address. •A pointer in C is merely a stored memory address. •The activation records for each function call are all together in memory, and they are organized in a stack that grows downwards and shrinks upwards on function calls and returns respectively. •The return address of one function as well as the addresses of all of its local variables are allocated within one activation record. The designers of this decoder weren’t very good. They made it possible for us to attack the keys in two independent parts. Try to break the first two keys first, and do not try to break the third and fourth keys until you have succeeded with the first two. You can do the first part by specifying only two integer arguments when you execute the decoder. If you get the first and second keys right, a message that starts with From: will appear. This message is not the true message, but a decoy. It is useful, however, to let you know that you have indeed broken the first two keys. In breaking the first two keys, realize that the function process_keys12 must be somehow changing the value of the dummy variable. This must be so, because the variables start and stride control the extraction of the message, and they are calculated from the value of dummy. In breaking the third and fourth keys, try to get the code to invoke extract_message2 instead of extract_message1. This modification must somehow be controlled from within the function process_keys34. 3.One paragraph describing, in your own prose, what process_keys12 does. For example, you might say that it modifies a specific program variable. 4.The meaning of the first two keys in terms of variables and addresses in the decoder program. For example, you might describe key2 by saying that its X-Y bits contain the value to which variable start is set. Or you might describe key1 by saying, for example, that it must be set equal to the number of memory addresses separating the address of two specific variables. These are only examples. 5.One paragraph describing, in your own prose, what process_keys34 does. 6.One paragraph describing the line of source code that is executed when the first call to process_keys34 returns. 7.The meaning of the third and fourth keys in terms of variables and addresses in the decoder program. longer than one page. Do not get frustrated if this takes a little longer than you expected: brief and clear text often requires more time to write than rambling prose. Your teacher can tell you what word processors you may use to write your report. Chances are that you can write your report in a number of formats, and for simplicity’s sake, you might even want to write it using Notepad. 故形参key3的地址 + 16 = 存储值为函数返回地址的那个地址。即：key3 = 16 / 4 = 4. The line of source code that is executed when the first call to process_keys34 returns.